Above: Judy Falen, consultant with McGraw Hill Education, speaks to SVRTC members about ALEKS. The first SVRTC meeting of the 2017-18 school year was well attended by eighteen SVRTC divisions (Amelia, Brunswick, Charlotte, Cumberland, Danville, Dinwiddie, Franklin City, Greensville, Halifax, Henry, Hopewell, Lunenburg, Mecklenburg, Nottoway, Pittsylvania, Prince Edward, Prince George, and Southampton). Jeremy Satterfield, Director of Community Outreach and Innovative Programs, with MidAtlantic Broadband Communities Cooperation (MBC), updated members on their work with the FIRST Robotics program (FRC). This is the third year that MBC has joined with SVRTC to support FRC. Mr. Satterfield stated that MBC will continue to give existing robotics teams $6,000.00. This money will enable the teams to purchase the FIRST Robotics kit and registration for two district events. In addition to the $6,000, MBC will match fundraising contributions up to $4,000.00 per team. He also added that Bill Wilson has provided his expertise and will continue to do so in this year’s FRC challenge. During the meeting, SVRTC members were treated to lunch by McGraw Hill Education. 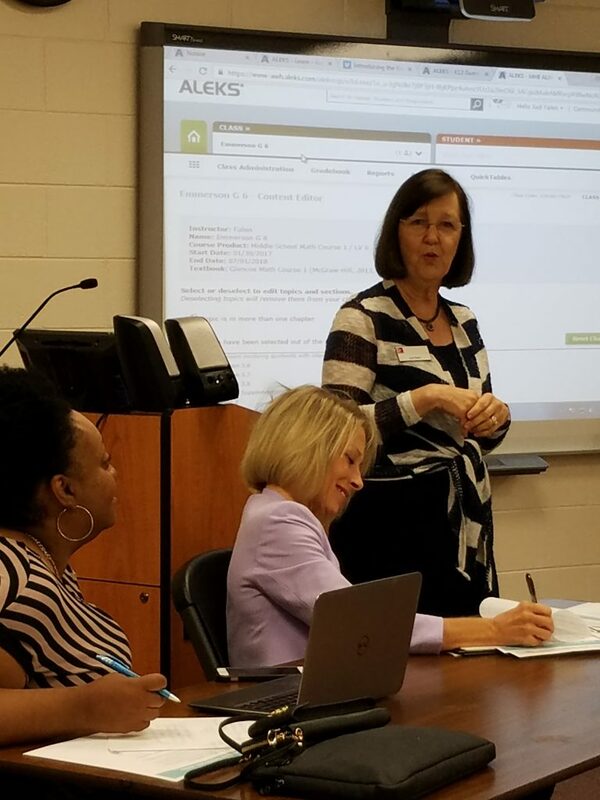 Paul Lancaster and Judy Falen, consultants with McGraw Hill Education, introduced members to Assessment and Learning in Knowledge Spaces (ALEKS ). ALEKS is an online math program for grades 3-12 that uses artificial intelligence and open-response questioning to identify what a student knows and doesn’t know. Through individualized learning and assessment, ALEKS targets the topics each student is most ready to learn and presents a personalized learning path that adapts to each student’s individual needs. Ms. Falen presented real-world results from schools in Utah, California, and Virginia that measured student results. In addition to ALEKS , members were introduced to Redbird Professional Learning which offers a flexible approach to professional learning. Mr. Lancaster explained that Redbird Professional Learning collaborated with Stanford University to help educators transition to the changing standards, technology and evolving classrooms. The result is a product and services that integrate the best practices and research of highly effective training and development into on-demand and in-person workshops.